Cape Town Holiday package of 4 Nights 5 Days is a stand-alone package but can also be used as a before or after stopover, on the way to your chosen destination. Mix and match as many add-on tours as you like to create your ultimate dream South Africa Holiday. Enjoy spectacular scenery, beautiful beaches and luxury accommodation options on your Cape Town holiday. Fill your days with shopping at the buzzing V&A Waterfront, take a ferry trip across the bay to Robben Island or enjoy a scenic drive to Cape Point where the two oceans meet. Cape Town is a naturally beautiful city, with world-famous Table Mountain as a majestic backdrop & one of the natural wonders of the modern world – to the one side while the Atlantic Ocean caresses her shores on the other. A scenic Garden Route Tour may be combined with your Cape Town holiday showcasing the beauty of South Africa’s own Garden of Eden. Add-on Hermanus where you can watch the whales from land during June to November, followed by Oudtshoorn , the Ostrich capital of South Africa & in Knysna explore the 20 million year old Cango Caves with hidden chambers cut deep in the limestone rock layer. From leisurely activities to adrenaline inducing adventure, from high-end shopping to competitive sports, from rustic food markets to haute cuisine, Knysna offers you the finer things in life. Stop over at the picturesque village of Storms River & head to the Storms River Mouth for unrivalled views of the Indian Ocean and its relentless waves that crash against the rocky shores. Your 4-Night Garden Route Tour ends in Port Elizabeth with its numerous beaches from where your onward plans begin. Contact us to design your perfect Cape Town holiday with a Garden Route tour. Enjoy spectacular scenery, beautiful beaches and luxury accommodation options. Spend quality time enjoying Cape Town in all its splendour. Enjoy a Peninsula Tour visiting the scenic Cape Of Good Hope Nature Reserve, the place where 2 Oceans meet. Sample award winning wines on the glorious Cape Winelands Tour. Explore the famous Victoria and Alfred Waterfront or enjoy 360 degree views of Cape Town with a cable car ride up the legendary Table Mountain. Our hotel accommodation is carefully selected to ensure that our packages offer you value-for-money within their respective categories. Each one is categorised according to its location, food, service and general ambience. Standard: Property offering value for money, quality accommodation. Deluxe / Superior Deluxe: Property offering outstanding luxury accommodation. 4 Nights Bed and Breakfast at your chosen hotel. Combine ‘Stylish Cape Town Luxury’ package with a 3-Night on a Victoria Falls Holiday. Choose from our Standard, Deluxe or Superior Deluxe properties from where to view the glorious spectacle of Victoria Falls, one of the world’s greatest natural wonders. Inclusive of a romantic sunset cruise on the Zambezi River and guided tour of the Falls. The quiet little fishing village of Hermanus has become known as the heart of the Cape Whale Coast and has the best shore-based whale watching in the world (seasonal – during their annual migration between July – November only). Combine a thrilling Safari in Kruger National Park after your Cape Town Luxury holiday. Select from our 3-Night packages for up-close encounters with Africa’s wildlife. Contact us for a selection of Standard, Deluxe or Superior Deluxe lodges and camps and experience the serene and unmasked beauty of the African bush. Spoil yourself by adding the perfect ending to your Cape Town holiday experience. Have a beach break in the bliss of the exotic Indian Ocean Islands. Book now as an add-on and you will receive an ‘add-on’ discount from SafarisOnline. Met on arrival Cape Town Airport and transfer to your accommodation in Cape Town, your base for 4 nights on bed and breakfast basis. Deluxe Serviced Self-Catering Appartments in Cape Town: Waterfront Village Boutique Appartments. Depart on a full day tour to Cape Point beginning with a cruise along Millionaire’s Paradise of Clifton and Camp’s Bay, onto the charming coastal town of Hout Bay, cruising along the legendary Chapman’s Peak drive with its breathtaking views and reaching the Cape of Good Hope section of the Table Mountain National Park with its rugged and intriguing landscape. It’s wild, rugged and one of the most memorable coastlines you’ll have encountered. Explore the beauty of the Cape Winelands, visiting both Paarl and Stellenbosch before stopping for wine tasting at some of the finest wine estates at your own pace. A superb day dedicated to celebrating the exceptional winelands region and the breathtaking views. Today is a day at leisure. We suggest a visit to the V&A Waterfront or a Cable Car ride up the legendary Table Mountain. From the summit of Table Mountain you will be able to see to the end of our world, including the City and surrounding layout of the southernmost tip of Africa. Spend quality time enjoying Cape Town in all its splendour. Transfer to the airport in time for your onwards arrangements. 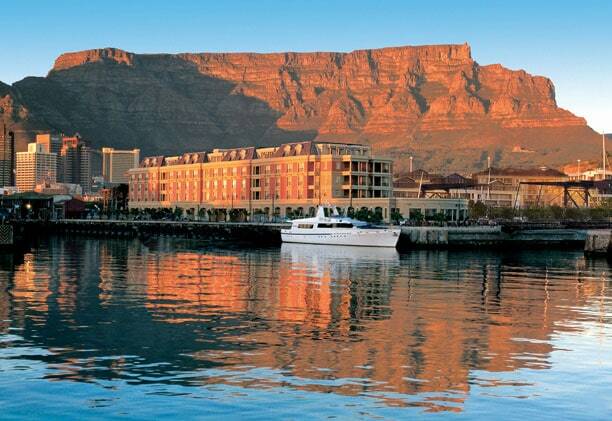 Cape Grace Hotel is set on its own private quay on Cape Town’s vibrant Victoria & Alfred Waterfront with the majestic Table Mountain as a backdrop. All 121 rooms at the Cape Grace are spacious and decorated in exquisite furniture, luxurious fabric and intriguing detail. The rooms have large French windows looking out onto the harbor and yacht marina. Features include en-suite bathrooms, Internet connections and fully stocked mini bars. The penthouse suites are the epitome of personal service that range from a luggage unpacking service to planning a personalized meal with the hotels Executive Chef. The penthouse suites boast a Jacuzzi and outdoor dining area, the perfect place to set the mood for a romantic evening. On the top floor of the Cape Grace Hotel is an African influenced Spa that offers a range of pampering treatments. The Signal restaurant has a spectacular view of the yacht Marina and Signal Hill and offers exquisite cuisine. This restaurant also boasts an array of live performances, it has easy listening jazz as the main feature every Thursday and Saturday night. The finest Cape wines and a selection of over 420 whiskies are stocked in the Bascule Whisky bar and wine cellar. One of the Leading Hotels of the World, the Table Bay Hotel in Cape Town is set on the historic Victoria & Alfred Waterfront, conveniently located against the stunning backdrop of the Table Mountain and the Atlantic Ocean. The Table Bay Hotel restaurants offer an incredible selection of dining options with three exceptional restaurants and two fully-stocked bars. The Spa at Table Bay Hotel provides holistic care for the skin and body that will leave you feeling refreshed and pampered. A number of luxury facilities that add to the already inviting environment at Table Bay Hotel Spa include steam rooms, a hydro bath, laser therapy, gym and a double treatment room. Waterfront Village, situated on the water’s edge in the picturesque Victoria and Alfred Waterfront Marina offers guests luxury serviced apartments offering superior services and facilities. Private balconies and patios offer sweeping views of the canal, harbour, Victoria and Alfred Waterfront, yacht basin or Table Mountain. Select from one to three bedroom luxury apartments. All serviced apartments are fully equipped and well appointed, including satellite television and DVD players, washing machines, tumble dryers and dishwashers. Situated within the world famous V&A Waterfront, guests staying at the Waterfront Village can reach an abundance of shops and restaurants on foot. Housekeeping services, a central reception, concierge, security and luxury transfer services make your stay at Waterfront Village an exclusive experience. Guests have access to five swimming pools, a state-of-the-art gym, the Spa features 3 specialised treatment rooms, including a wet room, couples massage room, facial and manicure room and an aesthetic medicine room. Crafted around tranquil waterways the inspired architecture maximises the panoramic views. Southern Sun Waterfront is situated in the heart of Cape Town’s most sought-after areas right in the midst of the city’s most popular landmarks.The Hotel is a short walk away from the famous Victoria and Alfred Waterfront. Post-card views of the harbour and of Signal Hill are rivalled only by the stylish, inviting presence of the hotel itself. The hotel is close to the city’s business district, shopping locations and entertainment venues which makes it the perfect choice for both business and leisure travellers. Complimentary added value services: Use of hot spa area: steam room, sauna, rain and body shower; limited wireless internet access; morning tea and coffee with wake up calls; luxury chauffeur transfers within a 10km radius including Kirstenbosch Botanical Gardens from 07h00 to 23h00. Cape orientation, introduction to the Cape. Subject to availability. Special Moments : Minimum stay 3 consecutive nights, a luxury arrival airport transfer,bottle of chilled sparkling wine and home-made chocolates in your room on arrival, A romantic dinner in Signal Restaurant OR A couple’s massage in The Spa at Cape Grace, a special turndown gift every night. This offer applies to couples on honeymoon or celebrating an anniversary. Subject to availability.